(Natural News) Did you know that aside from helping you stay hydrated, juicy and fresh watermelon can also help treat various health conditions? The largest edible fruit grown in the U.S., the watermelon is native to the Kalahari Desert in Africa. The fruit has various minerals and vitamins like beta-carotene, potassium, and vitamins A, C, and B-6. Additionally, watermelon has citrulline and lycopene, two crucial bioactive compounds. Lycopene – The tomato is rich in lycopene, a carotenoid found in red foods like papaya, red carrots, and watermelon. Lycopene is a potent antioxidant, and it can help prevent heart disease. The carotenoid can also fight free radicals, which are linked to the development of Alzheimer’s disease, many cancers, and heart disease. Potassium – Watermelon, like other vine fruits, is full of potassium. This important electrolyte is needed for nerve and muscle function. As the body ages, it also requires potassium since it can help reduce high blood pressure. Potassium can also lower the risk of bone density loss, kidney stones, and stroke. Vitamin A – The human body turns beta-carotene into vitamin A that can help keep the eyes, hair, and skin healthy. Besides helping to create and repair skin cells, vitamin A can also strengthen the immune system. Vitamin C – Vitamin C functions as an anti-cancer agent and an antioxidant, and watermelon’s vitamin C content can help lower blood pressure. In Russia and Central Asia, watermelon is used as a diuretic and a blood cleanser. 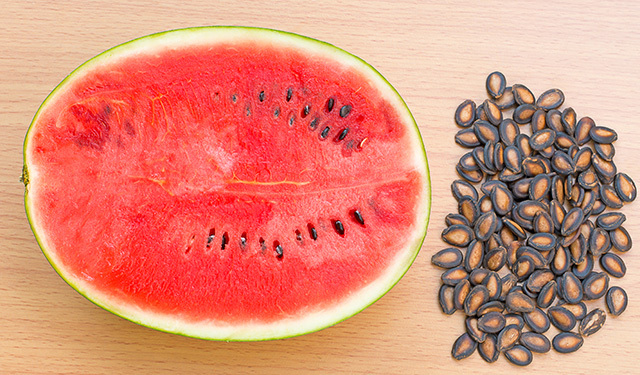 Traditional Chinese Medicine, which utilizes watermelon for its cooling and moistening properties, also used the fruit to treat edema and inflammation of the kidney and urinary tracts. Since watermelon is 92 percent water, the traditional uses of the fruit have overlapped with current uses, such as for cleansing, eliminating impurities, and hydration. Watermelon’s traditional medicinal uses are gradually being confirmed scientifically, such as its application against health conditions like aging, dehydration, erectile dysfunction, and kidney disease. The fruit’s antioxidant and nutrient content also help protect the body against many different conditions. You can follow the recipe below to make nutritious pickled watermelon rinds. Use a vegetable peeler to remove the tough green outer rind from the watermelon. Discard the outer rind. Slice the watermelon into one -inch thick slices. Cut away everything, and leave at least 1/4 inch of flesh from each slice. Set aside the flesh for other uses. Cut the rind into one-inch pieces for about four cups of the rind. Combine the chili, ginger, peppercorns, salt, star anise, sugar, and vinegar, then add half a cup of water. Let the mixture boil in a large, non-reactive saucepan. Stir to dissolve the salt and sugar. Add the watermelon rind. Reduce the heat and simmer for at least five minutes until the rind becomes tender. Remove the rind from the heat. Cover the rind with a small lid or plate, so it stays submerged in the brine and let it cool to room temperature. Transfer the rind and liquid to an airtight container. Cover and chill for at least 12 hours. Visit Fresh.news for more articles about the benefits of eating watermelon.